GAINSVILLE, Florida, March 15, 2011 (ENS) – The rapid spread of invasive lionfish along the U.S. eastern seaboard, Gulf of Mexico, and Caribbean is the first documented case of a non-native marine fish establishing a self-sustaining population in the region, a U.S. Geological Survey marine expert said today. “Nothing like this has been seen before in these waters,” said Dr. Pam Schofield, a biologist with the USGS Southeast Ecological Science Center in Gainsville. Indo-pacific red lionfish, Pterois volitans, originally came from the Indo-West Pacific Ocean. They were first reported off Florida’s Atlantic coast in the mid-1980s, but did not become numerous in the region until 2000. Since then, lionfishes have been documented along the entire U.S. east coast from Florida to Massachusetts, east to Bermuda and south throughout the Bahamas and in other Caribbean nations such as Turks and Caicos and Cuba. Schofield says no one knows exactly how the predecessors of the current population first made it into the Atlantic and Caribbean, but she believes the invasion serves as a warning of the dangers posed by the introduction of non-native fishes into an ecosystem. Schofield says it is not yet clear exactly how the new invasive species will affect reefs in this part of the world. She says lionfish have been observed preying on and competing with a wide range of native species. Schofield has spent years compiling and verifying sightings of lionfishes, reaching out to local experts such as biologists, museum curators, natural resource managers, divemasters and citizens groups to collect detailed records of specimen collections and sightings throughout the region. The records were compiled in the USGS Nonindigenous Aquatic Species database and used to map the fishes’ spread. In the Florida Keys, Schofield and her team are working closely with partners from the National Oceanographic and Atmospheric Administration in Beaufort, North Carolina and Reef Environmental Education Foundation in Key Largo, Florida to analyze lionfish diets, an important first step in understanding their impact on reef ecosystems. Eradication of lionfish is probably not possible, admits Schofield. Yet, local control efforts may be able to keep the population tamped down, releasing pressure on the native ecosystem. 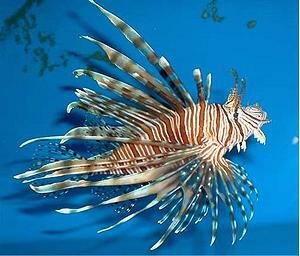 Many Caribbean countries such as Bermuda and the Cayman Islands have begun lionfish control programs. In the United States, the Reef Environmental Education Foundation, REEF, held a series of lionfish derbies in the Florida Keys that resulted in more than 600 lionfishes being removed from the Florida Keys National Marine Sanctuary. Tricia Ferguson and Lad Akins have written a new cookbook that features lionfish recipes. “That lionfish are delicious table fare with a delicate buttery flavor may be our best hope for helping to remove the fish and minimize its impacts,” they say. Proceeds from the sale of the cookbook will support REEF’s marine conservation and lionfish research activities.